TUCKER CARLSON is so scary, it feels like Halloween. So let’s tell this slimelord how creepy he is at his home on Friday evening. Surprise surprise. Tucker Carlson, that racist misogynist mouthpiece on FOX News, has always been a racist misogynist mouthpiece. As mainstream media sorts through his past comments, revealing that he has the soul of a lecherous swamp monster, much public outcry has ensued. Carlson is a horror — and he is one of the most powerful right-wing personalities on television. 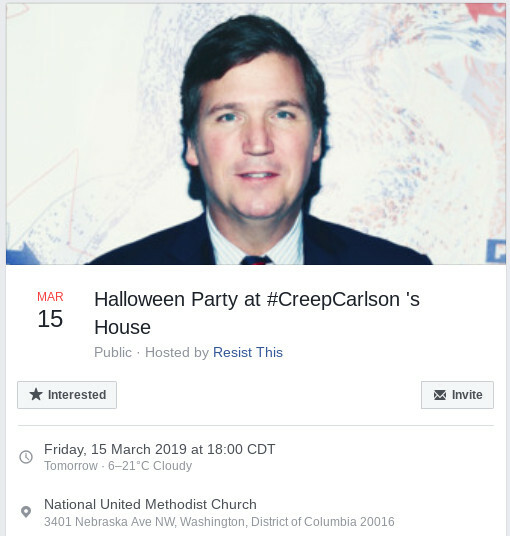 So let’s wear fun Halloween costumes and let Tucker know how we feel about his statements. Important: This will be a fun, transparent, and safe event. It is legal to demonstrate at the homes of the rich and powerful. We intend for all to be conducted in a safe manner. If you don’t have a costume, come anyway. There will be extra costume pieces and signs to go around.